Redken Creative Consultant Guido created a unique pulled back style that was sleek and sophisticated in the front yet girly with a natural in the back, perfectly reflecting the aesthetic of Victoria’s Beckham’s Spring/Summer 2012 modern, chic collection. – Starting with dry hair, comb back a 4-5 inch top section from the forehead to the crown and comb a generous amount of hardwear 16 super strength sculpting gel into the whole section. Clip the end of the section up out of the way. – Apply guts 10 root targeted volume spray foam through the remainder of the hair until evenly distributed and damp with the product. – Clip the front section at the crown back with a metal bar clip and then coat the top section with glass 01 smoothing serum for a lacquered finish. 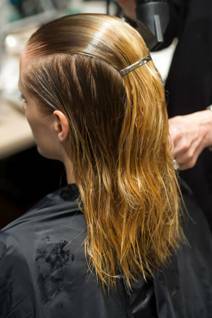 – Let the hair air dry or rough dry with a blow dryer and then add forceful 23 super strength finishing spray for texture, concentrating on the sides so that no stray hairs are around the face.